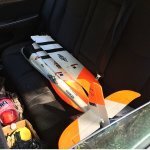 About six months ago now, i was surfing kijiji for any rc planes for sale in my area. I scrolled past about 15 gassers, a few gorgeous balsa gliders (i came SOO close to buying them), and a very tempting offer on a 2000mm electric supercub. But i stopped cold when i chanced upon a used Multiplex Easyglider Electric. Y’see, I love gliders. Folded paper, laminated balsa/paper, balsa chuck gliders, you name it. Over the years i’ve built a good working knowledge of how to make gliders fly the way i want hands-off. But this beauty with orange wingtips and matching orange empennage was gong to be my official graduation from FF into RC. 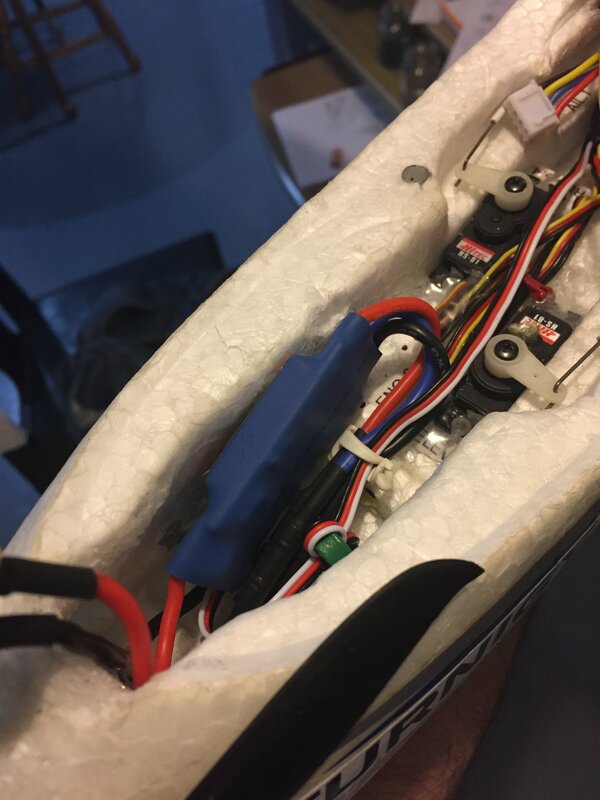 Listed at 100$CDN, it came with a crumpled nose, a bent motor shaft, a new motor, the lemon rx 7ch stabilizer, and three 2s 2100mah lipos, one of which was a little bloated (remember this, its important later). The previous owner (an awesome guy, he gave me his number to keep in touch, hugely beneficial when i had problems with the power switch), had lawn-darted it and just didnt want to spend more time on it instead of the more exciting planes he had. Flash-forward to bringing my new baby home. I spent roughly 20mins gently hammering the shaft back to almost-straight. 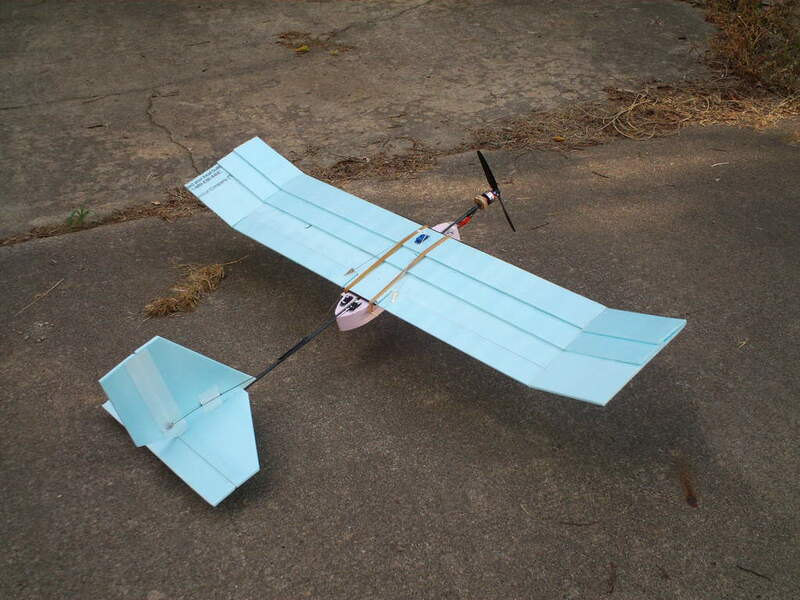 Figuring out the battery placement and setting up a model on my Dx8e, it was time for a glide-test. After shaking off my nerves at hefting this 2000mm monster (its affectionate nickname) above my head, i was thrilled to see this beauty sail accross my front yard with just a firm toss (it was more like a baseball throw, i was really worried that the weightwould carry it down. Remember, im used to working with gliders that at most weighed 80g). I actually had to force it down for the sake of trees, and bent the motor shaft again, XD. After that, I took it to my old High-School’s soccer field and immediately fell in love with the plane. Its very gentle, and the stock power combo had more than enough power for a newbie like me (it powered me out of three stalls, hehe😅). I didnt try any soaring, so things were exciting/scary as i was flying at <50’ above the ground. Flash-forward another three weeks and im back at my old school, getting ~20min flights on each battery by climbing until shes just about half the size of a dime, cutting back, and taking small naps as the monster takes its time coming back to earth. This is where that bloated battery makes an appearance. I knew nothing about lipo safety at the time (im a low-key expert now), and i wanted to squeeze one more run out of battery no. 2 (old owner had EVERYTHING labelled) with ~1:30 left on my timer (set to 20% throttle by default). When i set her down to pack up, the battery wouldnt unplug. Overheating due to over-discharge, the casing on the bananna plugs had melted together, and the battery was now fused to the esc. Frantic that the lipo would completely over-discharge (unaware it already had) and burn the world to ashes, i tore it off the esc, leaving the esc plugs bare. When i got home, i was trying to slip a new sleeve over the esc plugs when my dad came by. 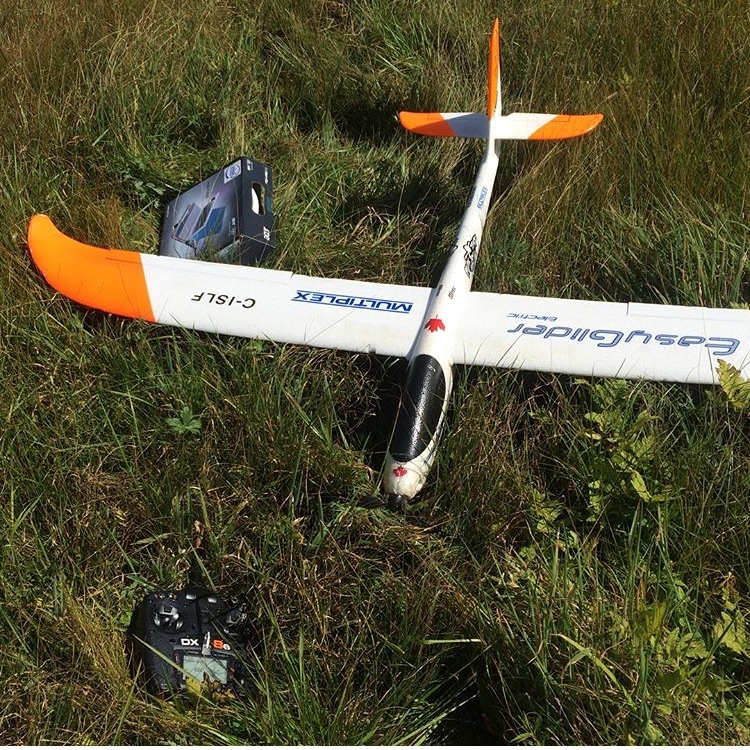 The plane wasnt binding because (as i know now) the transmitter was too close and overloading the rx with code. So dad tried to help by crossing the polarity of the wires. Yeah, it ended how you’d expect, in a puff of smoke and a dead esc. 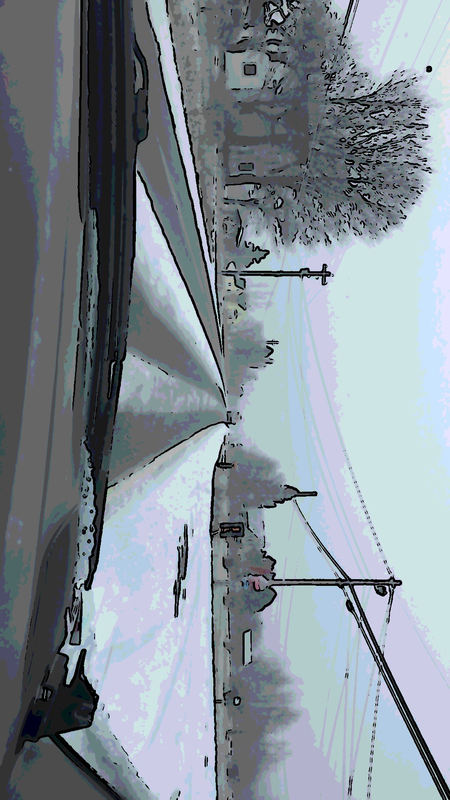 Which brings us to the present. Between waiting for all the parts from hobbyking for a brushless upgrade ive done lots of reading here and on rcgroups. The Easyglider Electric seems to be completely overshadowed by its sisters the Easy Star (l & ll) and the Easyglider Pro(4). Being and old bird, my monster has seen her fair share of dings and user-errors (take slamming into the side of a 50’ cliff after my first attempt sloping in low but gusty wind with only cosmetic damage as an example), but keeps on giving me more and more reason to love RC flight. 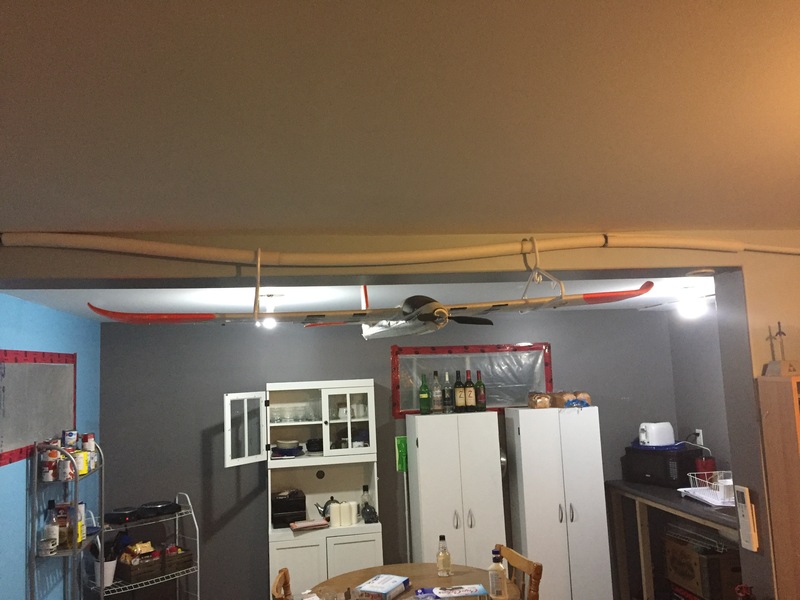 I plan on documenting the brushless conversion later when the final parts arrive, but for now, does anyone have any stories to tell about their first plane? About their first flight? 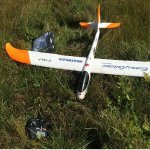 About getting in to RC aircraft, or even stories of brilliant un-sung legends in the consumer RC world? Looking forward to some overdoses of nostalgia and passion for flight! 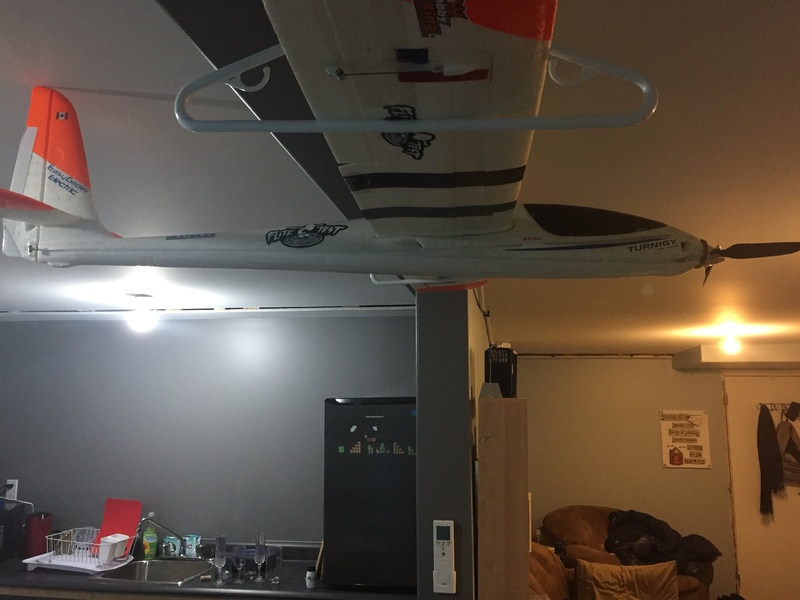 I just bought a calypso 73" WS glider from a co worker who used to fly. He said it was the most gentle flying experience he had ever had and I'm excited to get her in the air! Only reason I haven't already is the battery and esc have connectors that don't mesh with my charger. 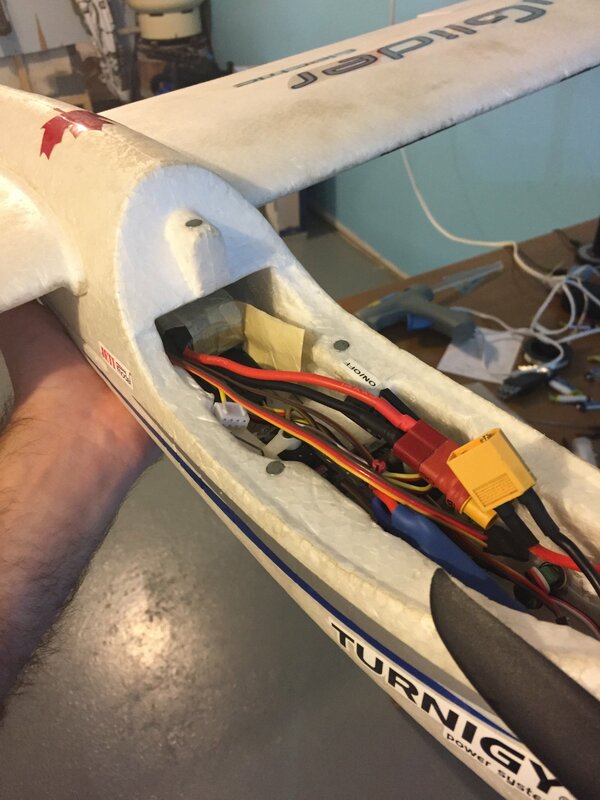 I should be getting the new connectors tonight or tomorrow and once I've converted the esc I'll have 3 1300 lipos which, from what I hear about these gliders, should give me an hour of gentle flight. Can't wait! No way! Dads never, and I mean never, do anything wrong or stupid. Ask my kids. It wasn't stupid, the ESC needed to be replaced, thats all. You should have seen his face, the poor guy was crushed 😢. Plus side is that it gave me a good excuse to go with a brushless upgrade. Dad has a long history of having too much “fun” with my rc equipment. (2 airhogs helis, 1 airhogs plane-thingy, 2 litehawk planes, plus now the esc). We’ve had lots of laughs about it. Even my mother is in on the fun. Rc should be a family thing...right? Ok, so for part one of the conversion. My main shtick was that i wanted to keep the original looks of the glider, because it has some really nice lines that i like looking at . So slabbing some plywood on there and sticking the motor on the front was a no-go. I’d ordered a radian pro firewall hoping it would kill two birds (strengthening the nose+keeping lines). But the geometry of it would ruin the lines of the nose, and the holes on the motor didnt line up. 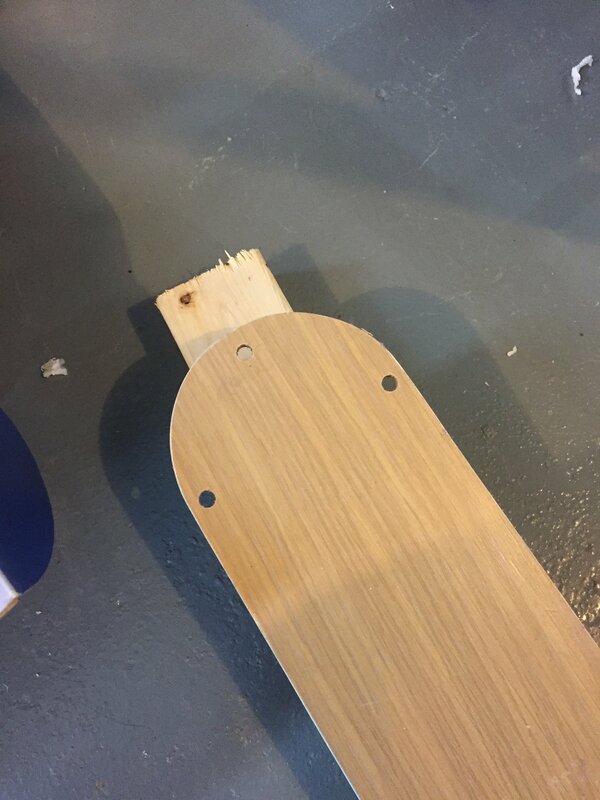 So first step was chopping off as little as possible of the nose, and hollowing out space for the Turnigy 2217. So now we get to actually securing the motor. 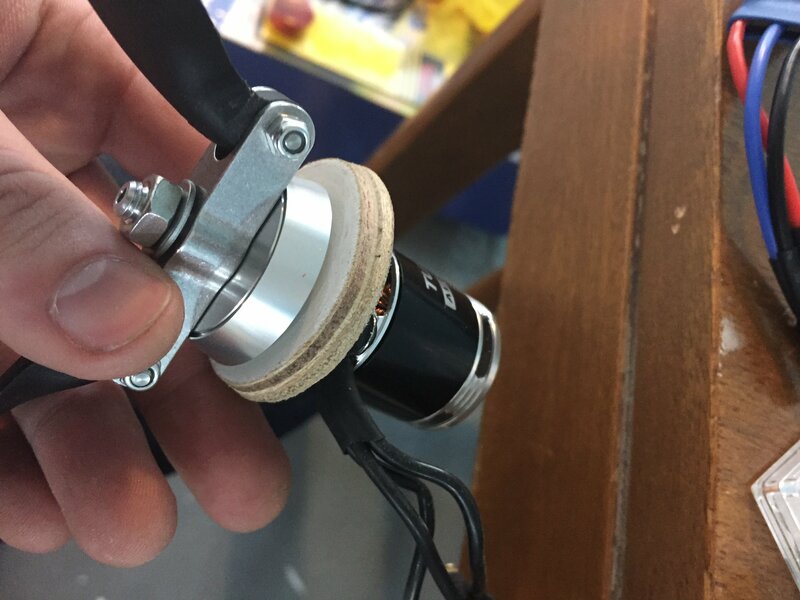 My first thought was to make a sort of doughnut out of plywood, cutting out a slot for the motor wires. Thinking that was a good plan, i now had to find some plywood. Rummaging through the basement, i find some old ceiling fan blades. Then run to the dept store to buy a hole saw, gel-type superglue, and some 5-min epoxy XD. 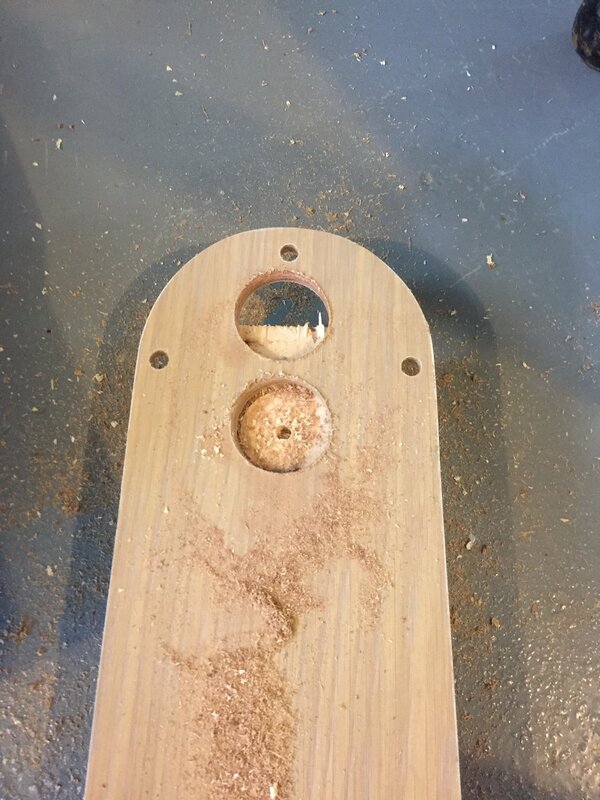 After feeling the resistance of the saw, i decided to use the conveniently centered hole and screw the motor to the back of the disk after some slight shaping with a sander. Now comes to even more cutting Aligning the motor wires to the bottom, i cut recesses for the motor bracket and wires, nestling nice and shug against the foam. 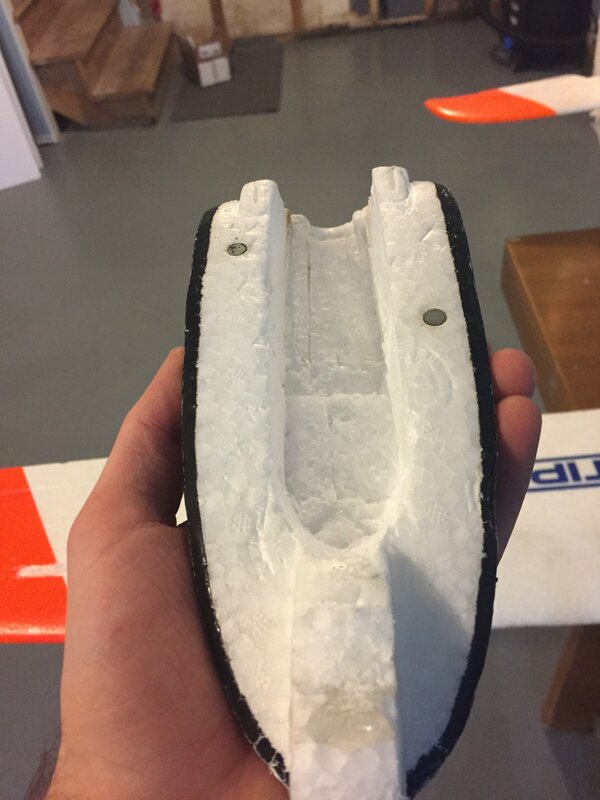 Turning the prop to check for any noise indicating a rubbing motor, i keep carving little by little until it turns nice and smooth. Needing to return the wires into the fuselage, i cut a slot into the bottom. 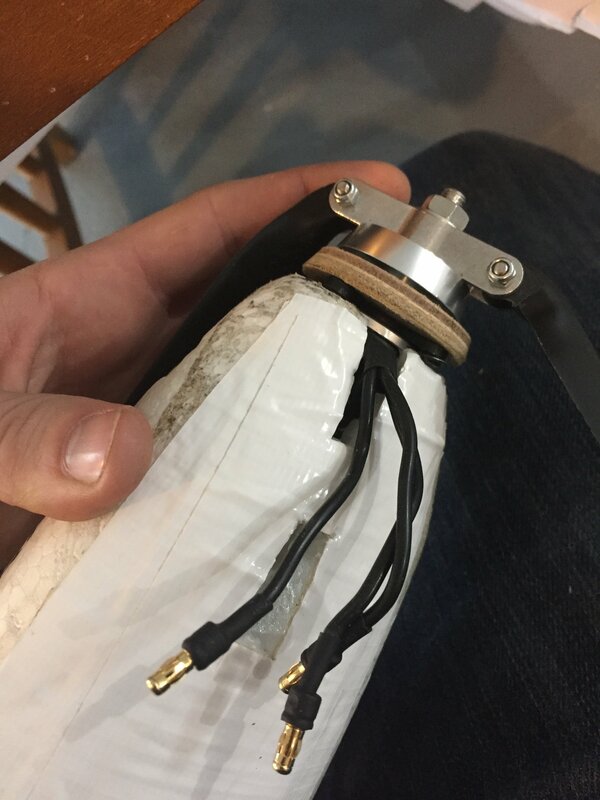 A generous helping of 5-min epoxy and white duct tape and the motor installation is complete! Hopefully, the original vent holes will be enough to keep it cool. Part 2: final electronics install and (re)maiden. Turnigy 2217-16 1050 kv, 71g, 220 watt brushless. Blessed be hobbyking, compared to the 150£ pack supplied by hitec, i was able to piece the whole pack for i think ~56$CDN! Talk about a happy wallet XD. The esc and battery fit in nice and snug with some carving. I went a little overboard with the esc since it was the only one with a good rating on the bec. *this is after maidening and finding cg WAY too far forward* I had tried keepig tabs on cg as i secured the motor, but the brushless motor is apparently a lot heavier than the old brushed+gearbox setup. The battery-bay under the wing isnt lent to easy cg adjustment by battery placement. 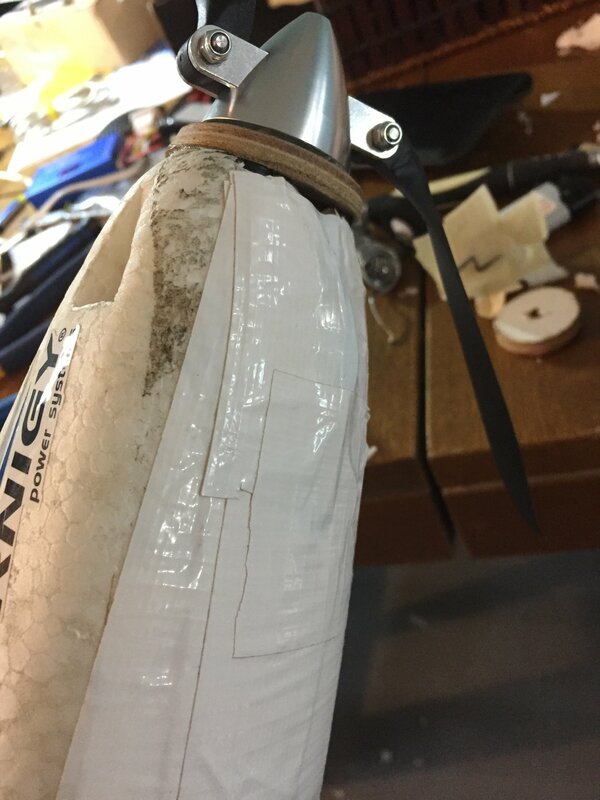 So a little tail-weight is needed, im just using some strips of coat-hangar taped to the rudder and elevator (can see bits of tape in pics). Pics show how shes being stored, just two coat hangars hanging from a conveniently exposed pipe XD. The fuse has soo much surface area that its just begging for decals. Speaking of decals, its got enough room on there for a NASCAR’s worth of advertising (ft gremlin, hitec, turnigy power systems, a few cdn flags, just to name a few 😂). And with this brushless upgrade, BOY IS SHE AS FAST AS ONE!!! I dont have a scale so i cant weigh it accurately, but she feels to be about 1kg AUW (which to my newbie ears sounds HUGE). But that 220watts is giving about a 1:1 power ratio. While before she was a gentle, medium-slow soarer, now the Monster has new fangs. It definitely is more of a warmliner now. I wasnt out for long on the re-maiden because wind-chill was -15C, but she can pull ~8sec vertical, and she can power through any wind i’ve dared to fly in. Flight was really sketchy because i mis-judged the weight of the motor, and she was really nose heavy. After waiting for a calm(er) day and rebalancing, gliding hasnt changed much except for a (much) faster forward glide. Sink is about the same. I had a hard time judging landings as stall-speed is higher. And faster forward movement means controls are touchy-er, i needed about 35-40% expo on all surfaces to smooth out flight controls. Im looking forward to flying again, but now i know i need a bigger field. I will probably start a new thread for that build. But for now, “The Monster” will be waiting for when i have the skills to fly her confidently and proudly.